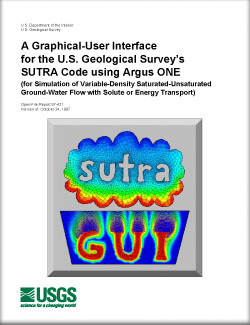 This report describes a Graphical-User Interface (GUI) for SUTRA, the U.S. Geological Survey (USGS) model for saturated-unsaturated variable-fluid-density ground-water flow with solute or energy transport,which combines a USGS-developed code that interfaces SUTRA with Argus ONE, a commercial software product developed by Argus Interware. This product, known as Argus Open Numerical Environments (Argus ONETM), is a programmable system with geographic-information-system-like (GIS-like) functionality that includes automated gridding and meshing capabilities for linking geospatial information with finite-difference and finite-element numerical model discretizations. The GUI for SUTRA is based on a public-domain Plug-In Extension (PIE) to Argus ONE that automates the use of ArgusONE to: automatically create the appropriate geospatial information coverages (information layers) for SUTRA, provide menus and dialogs for inputting geospatial information and simulation control parameters for SUTRA, and allow visualization of SUTRA simulation results. Following simulation control data and geospatial data input bythe user through the GUI, ArgusONE creates text files in a format required for normal input to SUTRA,and SUTRA can be executed within the Argus ONE environment. Then, hydraulic head, pressure, solute concentration, temperature, saturation and velocity results from the SUTRA simulation may be visualized. Although the GUI for SUTRA discussed in this report provides all of the graphical pre- and post-processor functions required for running SUTRA, it is also possible for advanced users to apply programmable features within Argus ONE to modify the GUI to meet the unique demands of particular ground-water modeling projects. Voss, Clifford I., Boldt, David, Shapiro, A.M., 1997, A Graphical-User Interface for the U. S. Geological Survey's SUTRA Code using Argus ONE (for Simulation of Variable-Density Saturated-Unsaturated Ground-Water Flow with Solute or Energy Transport): U.S. Geological Survey Open-File Report 97-421, 106 p.